Unless you’ve been living under a rock for the last 15 years, you don’t need me to tell you who Kelly Clarkson is. James Corden called on the three-time Grammy award winning American Idol to join him for an episode of Carpool Karaoke. The episode aired on Thursday, so they started off the episode with a throwback: “Since You Been Gone.” Kelly jumped into the harmonies immediately, along with belting out the infamous chorus high notes, proving that her vocal abilities have only improved over her nearly two-decade singing career. They also jumped into “Love So Soft,” the first single off her new album. “I think you’ve got a voice where you can make anything sound good,” said Corden, and he’s right – Kelly has proved over the years that she could sing the phone book. On Carpool Karaoke, we often forget that James Corden got his start as a stand-up comedian and not a talk show host. Corden is quick on his feet, witty, and an overall funny guy, and in addition to his outlandish stunts on Carpool Karaoke, like riding a roller coaster with Selena Gomez or surprising Sam Smith with Fifth Harmony, he is a huge part of what drives Carpool Karaoke (pun intended) and what makes it such an entertaining show. We were reminded of Corden’s importance on the show by a subtle joke he decided to throw Kelly’s way. After Kelly admitted her childhood dream to be a marine biologist, Corden asked, “You know who else wanted to be a marine biologist?” After Kelly responded with the expected, “Who?” Corden threw out the punchline: “Seal.” At first, Kelly assumed his response was genuine, until Corden couldn’t keep up the charade any longer and busted out laughing (as did anyone who can appreciate a good Dad Joke). They continued on their way, singing an old-school Kelly hit, “Because Of You.” That is, until James said he had a special surprise for Kelly and her husband. Since Kelly is constantly working, she and her husband (also her manager) don’t get to spend a lot of quality time together outside of work. 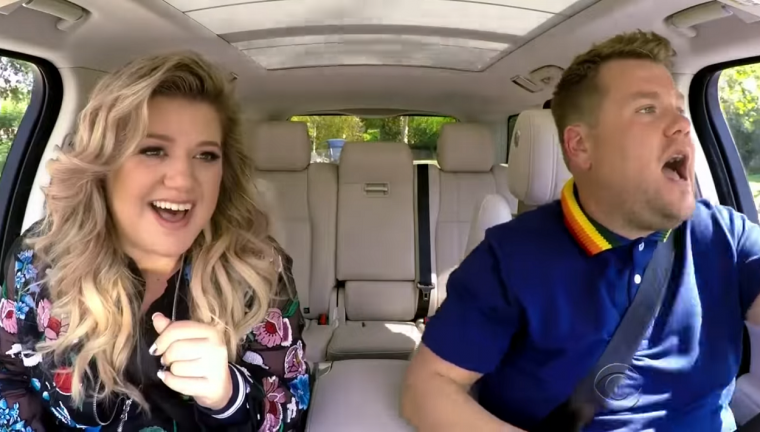 To fix that, Corden set up a makeshift date for them in the back of the car, complete with “champagne” (might have been sparkling apple juice, according to Kelly), chocolate-covered strawberries, and a personal violinist sitting shotgun. Once the date was over, James and Kelly hit the road once again to end the episode with an empowering song, “Whole Lotta Woman,” from Kelly’s new album.